Whether you are looking for gastronomic delicacies or antique objects : shopping in Brussels is always pleasant and fun; by going round the shops in the centre it is possible to discover the soul of the city and its inhabitants. Even if you have no intention of buying anything, the Galleries Saint Hubert (three in all), the covered commercial streets in the city centre rich in shops and café, certainly deserve a visit. For those who want to take home the Brussels flavour, the gastronomic souvenir par excellence is chocolate. It has a superior quality and it is prepared by authentic confectionery artists. Belgian chocolate is famous all over the world and it can be wrapped up in bars or in savoury pralines with various fillings. 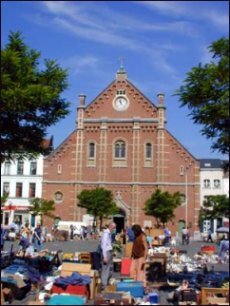 Those who are fond of ancient furniture, gifts and fancy goods have at their disposal a whole quarter, Sablon, famous for its numerous antique shops. In its peaceful streets and on its two main squares there are antique shops, art galleries but also ethnic shops and tea-rooms. The local markets of Brussels and its surroundings are known and appreciated everywhere. They are very numerous, both in the city and in the other communes of the region, and they can satisfy everybody's wishes. They are both big and coloured or small and suggestive; among the numerous local markets it is worth going to the antique market of Sablon – during the week-ends – and to the most famous local flea market that since over a century it takes place in Place du Jeu de Balle, situated in the popular Marolle quarter. Godiva and Galler are two of the most prestigious chocolate-producing Houses, located at the Grand Place. And then there is Marcolini, and Wittmaner , at the Place du Grand Sablon : greedy tourist crowd around in order to find a seat in the refined tea-room where they can taste the pralines. The Sablon quarter is the city’s heart of the antiquarian commerce and it boasts prestigious and rich shops. The most lively part of the quarter is without doubt the one around Place Grand Sablon – Rue des Minimes, Rue de Rollebeek and Rue Bodenbroeck – where it is possible to buy every kind of antique objects and modern antiques.